I have a limit as to how long I’ll try to key out difficult flowers, and I’ve hit mine with the fall asters! Right now, there are autumn-blooming asters everywhere that bear alternate, lanceolate leaves that lack petioles and clasp the stem. The leaf margin is usually gently toothed. Each flower head has 30 or more ray flowers that can range from pale to deep violet, and they bear golden yellow disk flowers. The two I’m trying to key out were found growing in wet conditions. Purple-stemmed Aster and New York Aster are similar in many ways, except that the stem of New York Aster is smooth, while the other is hairy/bristly. There are MANY garden cultivars of these plants and even the natives are highly variable, so identification can be tricky. New York Asters and Purple-stemmed Asters join the symphony of fall-blooming asters and goldenrods that are lighting up fields and meadows right now! Get out there and enjoy them, even if you, like me, can’t key them out to species! Purple-stemmed aster and goldenrod in Sept. This next one may be New York Aster. I’m basing it largely on the bracts (the small leaves behind the flower head). They are all reflexed (arched backward). 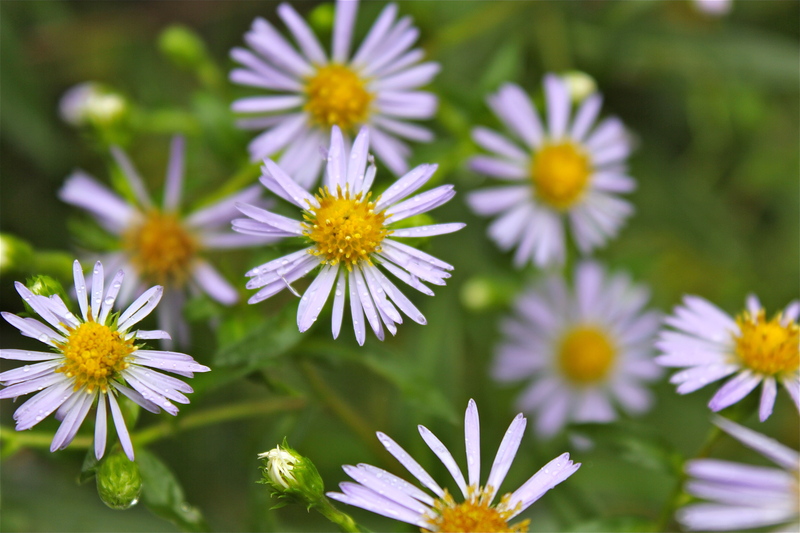 The leaves of New York Aster are supposed to be “narrowly lanceolate” and the flowers should be deep violet. So, maybe New York…maybe Purple Stemmed? Or even Crooked-Stemmed Aster? Help!